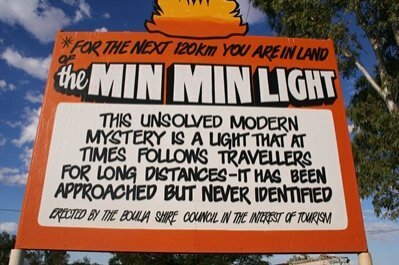 The Min Min Light is stuff of legend in outback Australia; the light was apparently first seen about 100 years ago around Boulia in central Queensland. The name for the lights are taken from the old Min Min hotel which burnt down in the early 1900's. Since then the legend of the lights has grown and there have been thousands of sightings by a wide range of different people over the years. There have been many explanations put forward as to the nature of them and many people are sceptical about them altogether but whether you believe in them or not is up to you. There are signs all over this part of the outback about the Min Min Light. That do not try to hide. To keep them in their sight. Or legend has it so. In reality they are old. And beckoning to the night.